Does each car in inner London cost society £8,000 in health and environmental cost over its lifetime? The topic of air quality is getting a load of attention in newspaper headlines in the days leading up to Clean Air Day (21st June, apparently). ...Air pollution is linked to about 40,000 premature deaths each year in the UK, compared with 98,000 preventable deaths a year which are attributable to smoking, the report said. Previous questions here have addressed the 40,000 premature deaths number but is this new estimate of the total cost to society of pollution from cars any more robust? The report looks at the whole of the UK but concludes London has the worst effects. For the sake of this question, though, lets stick to the headline number: is the estimated cost to society of each car in inner London really £8,000? TL;DR Yes, though only within a narrowly defined meaning: a petrol car driven only within Inner London, that drives an average distance for UK cars over its lifetime, will on average cause - through its pollution - health and economic damages valued at around £8k. The actual figures in the report are much more varied, complex and useful, varying between £1.8k and £24k for cars and vans driven an average amount over their lifetimes, with the amount depending on the vehicle type, where they are driven, and what fuel they use. These are deliberately conservative under-estimates of the damage costs, as there are many damages that go un-valued in the report. Some of these are discussed in the report. The costs are much higher for Inner London because the population of Inner London is much younger (so the lifetime economic costs of health damage are higher) and much more densely housed, so human exposure to pollution, for each unit of pollution emitted, is much higher. It's worth noting here a simplification in the headlines: the figures are higher for pollution emitted in Inner London. Clearly, not all driving in Inner London is from cars owned by Inner London households; and cars owned by Inner London households sometimes drive outside Inner London. The report is much more nuanced than the headline. The cost figure given in the news report is for a hypothetical car that drove only in Inner London, and drove the mean distance for all cars. From the study (p14). 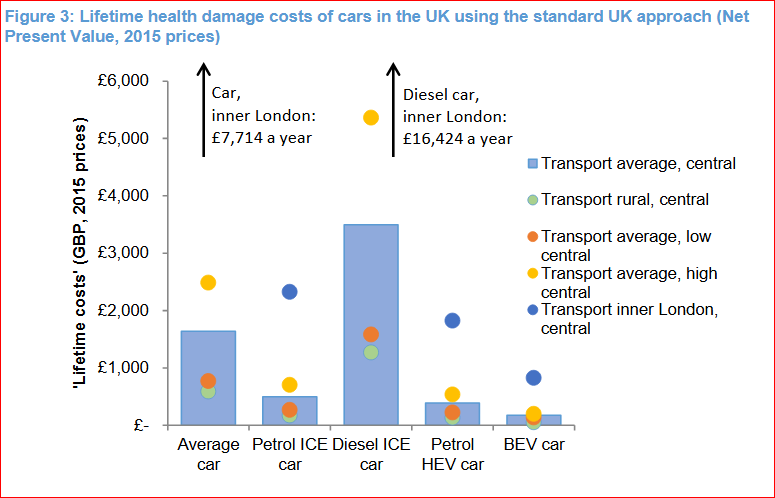 So, location matters: if a car were driven in inner London for all of its life the health damage cost would be much higher at £7,714; and it would be even higher for a diesel ICE car – £16,424. In contrast, lifetime health damage costs would be much lower if a car was used only in rural areas (£592), reflecting the fact that the size of the local population affected by the pollution from the car is less in these rural areas. Similarly, if a van were driven in inner London for all of its life the health damage cost would be higher at £24,004 – and lower £1,864 if driven mainly in rural areas. So that's why the journalists have run with this one example number taken from a rich, complex report. NB1 this is a brand new study. It will take time for the academic community to digest, analyse and publish responses to, and commentaries on it. Therefore, at time of writing, this answer can only consider the report on its own merits, and within the context of parallel literature. Within those constraints, the report's findings show integrity and usefulness. However, the media reporting of it has focused on one number which relates to a scenario which is a radical simplification of a subsection of cars in the fleet. To the reporters' credit, they haven't taken the single largest number (£24k per van driven only in Inner London) nor the single smallest number (£1.8k per petrol car driven only in rural areas) in the report. They have led with the one number that the university press release picked out. NB2 the claim is about an average (mathematical mean) car. You've asked about each car. The answer to your question is obviously "no" (as some cars are barely ever driven), but that's not what the claim is about anyway. It's important to read and understand the claim as it was written - this sort of rephrasing which distorts the original intent, is bound to lead to misunderstandings. Not the answer you're looking for? Browse other questions tagged environmental-health mortality pollution .